The number of victims relocated to relief centres in three divisions of Sarawak increased further, as five more centres were opened tonight. According to the state’s National Security Council spokesman, three of the centres were opened in the Betong division, while one each was opened in Sarikei and Sri Aman. 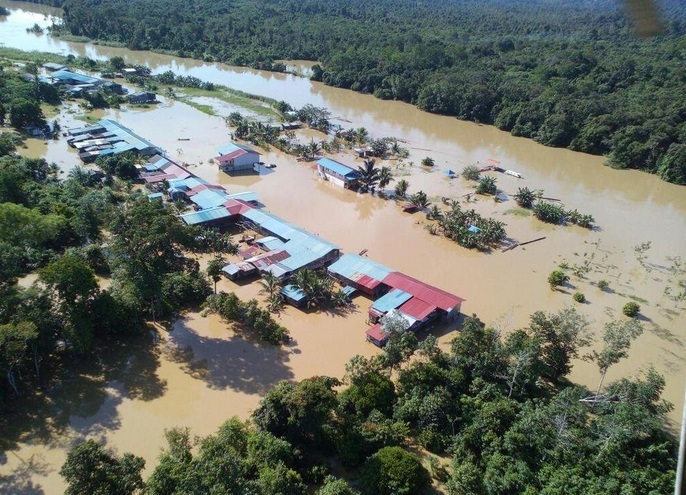 He said the number of victims placed in the Ceria Nanga Maras Budu kindergarten opened in Betong early this afternoon remained at 75 individuals from eight families. He said as of 8pm tonight, 47 victims from 16 families were currently housed at the Pakan Community Hall in Sarikei, while 41 victims from 14 families were placed at the Skim Skrang Community Hall in Engkilili, Sri Aman. Meanwhile, Betong Division Flood Disaster Operations Room spokesman Faridzul Kassim, when contacted, told Bernama the number of victims relocated to relief centres in the division had increased with the opening of two more centres at 6pm, which were the Dewan Panglima Rentap and Dewan Perpaduan Debak. “The information we have received as of now is that 70 victims from 18 families at Rumah Anyie, Mupoh, Baroh have been safely relocated to Dewan Panglima Rentap,” he said. He cited the heavy rains upstream as the cause of flooding in Betong. – Bernama, February 1, 2015.